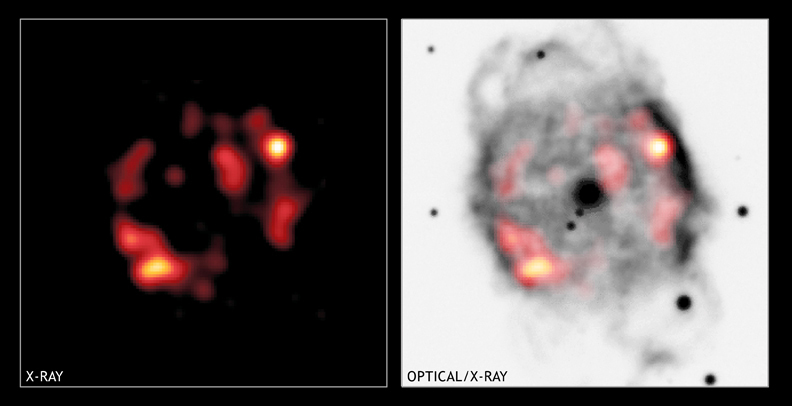 This composite X-ray (blue)/optical (red) image of the object NGC 40 shows hot gas around a dying, Sun-like star. NGC 40 is one of a class of objects called planetary nebulas, so-called because they look like the disk of a planet when viewed with a small telescope. Planetary nebulas provide a preview of how our Sun may look about five billion years from now when most of its nuclear fusion energy sources will have been used up. The star has puffed off its outer layer to leave behind a smaller, hot star with a surface temperature of about 50,000 degrees Celsius. Radiation from the hot star heats the ejected matter to about 10,000 degrees to produce the complex and graceful nebula (red) about a light year across. 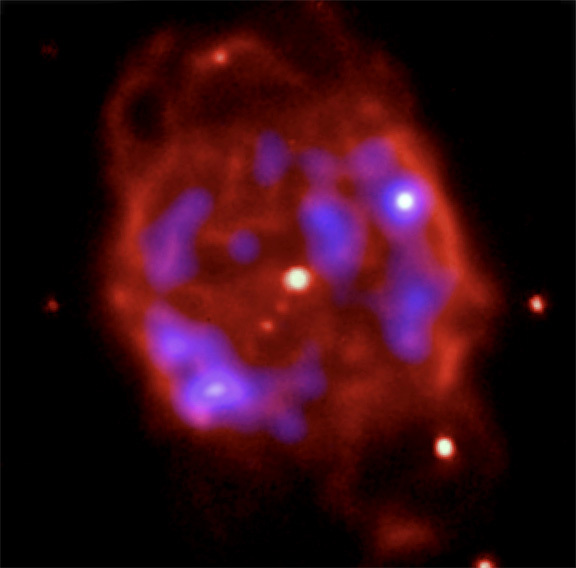 The X-rays in the composite image reveal a shell of multimillion degree gas (blue) that has been compressed and heated by a 2-million-miles-per-hour stellar wind from the dying star. The discovery of hot X-ray emitting clouds of gas within planetary nebulas such as NGC 40 enables astronomers to study the violent demise of Sun-like stars. By observing many planetary nebulas, astronomers hope to be able to determine whether X-ray-emitting clouds represent a short-lived phase of most dying stars or unusually violent conditions within specific planetary nebulas. In another 30,000 years or so, NGC 40 will fade away, leaving behind a compact, ultradense white dwarf star about the size of Earth. It is estimated that about one planetary nebula is formed in the Galaxy every year, and that they recycle about one solar mass of helium-enriched material back into the Galaxy per year. Coordinates (J2000) RA 00h 13m 01.00s | Dec +72° 31´ 19.00"